Standard statistical techniques can be used to arrive at a difference in the mean S/N of the antennas and to quantify the uncertainty in that statistic. The graphs shown in the article were derived from around 720 measurements of S/N for each antenna, 1440 in all. For statistical analysis, only measurements within 24 seconds of the centre of each 1min transmission interval were selected to avoid errors due to the slow response of the very narrow filters and some potentially variable time lag in streaming the rx audio back to the measurement point. The result of this was 582 and 584 observations for the antennas over the hour. Above is a scatter plot of the observations. The mean and standard deviation was calculated for each antenna, and from those a standard deviation for the two sets and degrees of freedom. 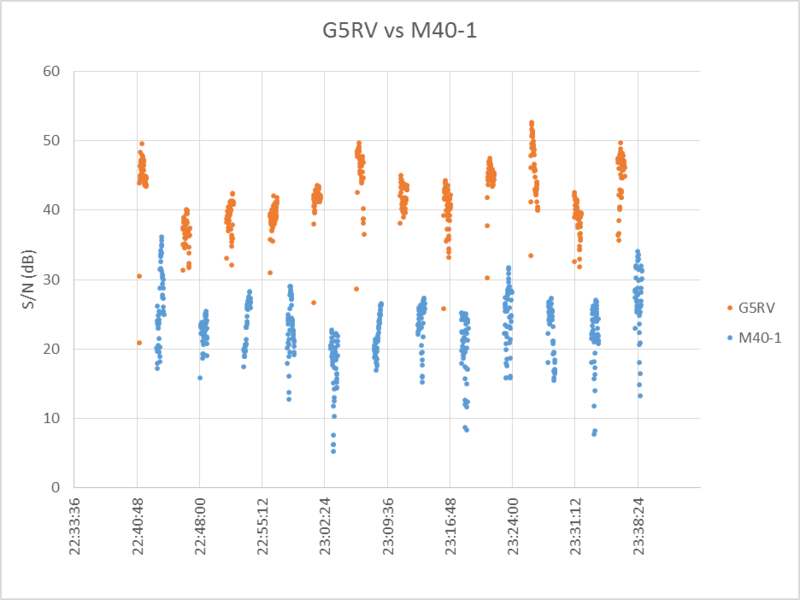 The result was that the means differed G5RV mean was 19.0dB higher than for the M40-1, and the difference in the means to a confidence level of 95% falls within 0.52dB of that value, ie the G5RV was better by 19.0dB +/- 0.52dB to a confidence level of 95%. Such a narrow confidence interval is the result of the difference in the means, the variance of each, and most importantly, such a large number of measurements. The S/N figures might look pretty good for 10W tx output, but they are measured in 20Hz bandwidth, so S/N in a 2kHz SSB receiver would be 20dB less. 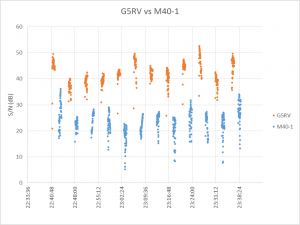 The G5RV required 2.1W for S/N in 2kHz bandwidth to exceed 10dB 90% of the time whereas the M40-1 would require 185W for the same S/N at the receiver.